Got Passion? | Dream. Write. Lead. You can’t teach passion. But you can catch it. In fact, it’s quite contagious. And like an infectious disease, it will sneak up on you from out of nowhere when you least expect it. It can slay giants, knock down walls, and open doors of opportunity. Passion can transform a person and change the world. However, unlike a real contagious disease, passion can be quickly dissolved. In leadership, we see it happen too often. Without a constant feeding of passion, we lose momentum, focus, and love for the game (career). Without passion, we surrender to the opponent. And where there’s no passion, there’s no followers. Consider yourself and your place of leadership. Are you constantly feeding your passion? Do you notice it to be contagious to your teammates and spectators? Surround yourself with passionate people. If they’re not the people on your own team, look elsewhere. Whatever the case, seek inspiration daily. Unplug. Rest. Relax. Ultimately, don’t let yourself burn out. An occasional recharge is necessary. Work hard–especially when others don’t. Exercise your mind and body for wisdom and strength, which leads to endurance. We must never let a lack of passion from teammates or coaches distract us from playing hard and being champions in our work. 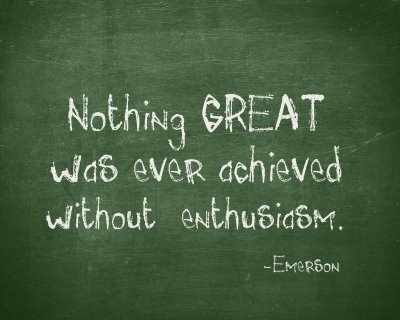 Passion is essential for leaders. It must be continually fed in order to be continually spread. I definitely think the people we surround ourselves with have such an impact on our mood and our drive. When I’m around positive and uplifting people I start to feel happier and when I’m around negative people that’s just as contagious. Well said, Stephanie! Thanks for the encouragement!